This agreement is designed for use where two parties are involved in the exclusive licensing of patents and related technology. This agreement is for use in any state in the United States. You need this document if you are a licensee or licensor involved in the exclusive licensing of patents. 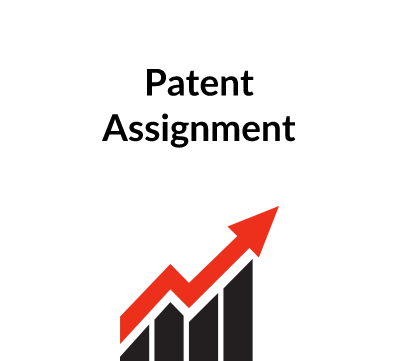 This form of Patent License Agreement is designed for use where two parties are involved in the exclusive licensing of patents and related technology. The parties are referred to as “Licensor” and “Licensee”. The form is relatively even-handed, if somewhat favourable to the Licensee, but should be viewed as a good starting point for preparing a draft agreement. This form provides a good starting point for preparing a first draft of Patent License Agreement. However, as with use of any form, it is very important to take the time to read the form in its entirety to ensure that it is customised appropriately for use in your individual situation. For all but the simplest of transactions, it can be anticipated that some customisation will be in order; and as mentioned above, it may also be advisable to consult with competent legal counsel and/or tax advisors. The blank in the first recital should be completed to provide a general guideline as to the intellectual property. The signature blocks should be customized as required. If either or both parties is an individual, then the language should be modified accordingly. The italicised language in brackets is for guidance only and should be deleted. 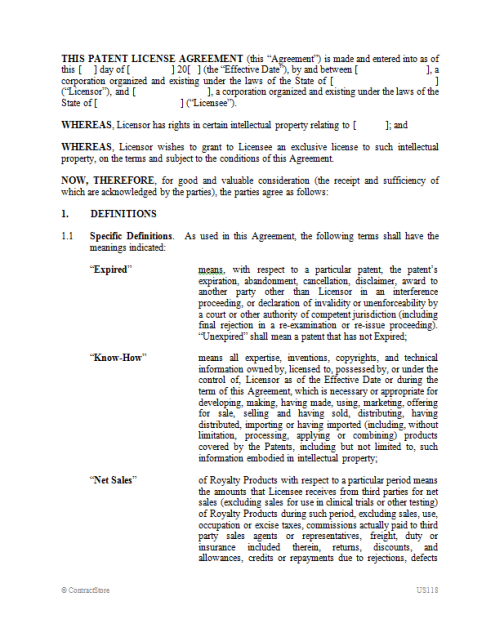 Paragraph 1 contains the operative definitions used in the Agreement. For the most part, these follow the standard conventional approach to these issues. The term “Technology” is the umbrella term which includes Patents (intellectual property that is the subject of a patent filing) and Know-How (intellectual property that is not the subject of a patent filing). The definitions of “Net Sales” and “Royalty Products” are also fairly standard, but should be reviewed carefully to ensure that they accord with underlying financial objectives and systems. 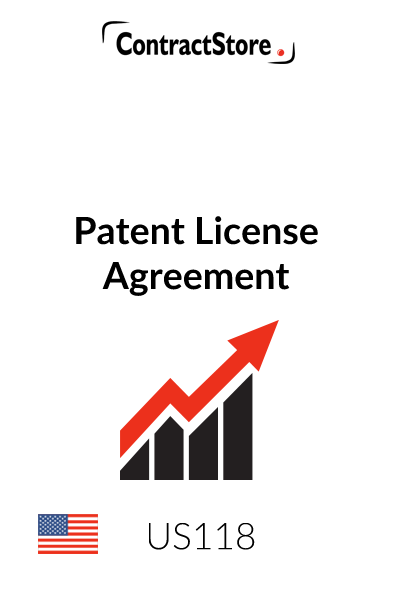 Paragraph 2 contains the license grant, and also provides for transfer of technology from the Licensor to the Licensee, as well as allocations of responsibility between the parties relating to protection of the licensed intellectual property. Paragraph 3 provides for payment of a royalty (and the appropriate percentage to be calculated on Net Sales of Royalty Products should be inserted into paragraph 3.1). If there is to be a royalty cap, this should be inserted in paragraph 3.2; otherwise paragraph 3.2 can be deleted and the reset of the paragraph renumbered. Paragraph 3.4 provides for reporting obligations – a quarterly report of sales to be provided by the Licensee to the Licensor. 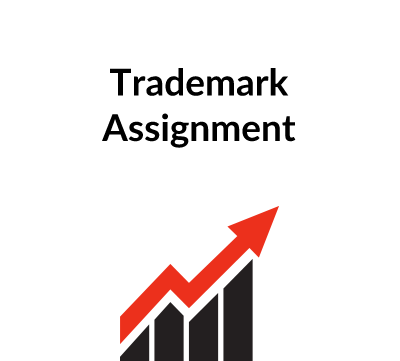 Paragraph 4 contains provisions relating to the intellectual property, namely that the Licensee is not under an obligation to commercialise the intellectual property and that the Licensee has the first option to enforce the intellectual property against third party infringement. Paragraph 5 contains some basic representations and warranties of the parties and basic indemnification and set-off provisions. The initial term of the Agreement should be stipulated in paragraph 6.1. Note that the form does not provide for automatic renewal. Paragraph 6.2 provides for termination prior to expiration of the term. Paragraph 6.3 clarifies that royalties cease to be payable once the royalty cap has been reached or if all of the patents expire. Paragraph 6.4 provides for survival of obligations upon termination. Choice of law can be contentious in U.S. contract negotiations because there are 50 states to choose from, and each party may have an instinctive bias in favour of using its own state law. Unless there is some reason to pick another state’s law (e.g., more favourable substantive law), it is customary to pick the laws of the state with which the drafting party is most familiar (again, usually its own state). This choice of law provision picks the laws of a single state (federal laws apply regardless of the state law election), which is most likely to be respected by the courts if it has some relationship to the contract (subject to application of mandatory principles of local public policy). In U.S. litigation, the prevailing rule is that each party bears its own litigation costs (subject to some narrow statutory and other exceptions). The language in paragraph 7.3 is intended to impose the so-called “English rule” to litigation costs. • Paragraph 8.1 provides for survival of the representations and warranties beyond the closing date. • Notice information should be completed in paragraph 8.2. Notice by e-mail could also be added as an option if the parties are comfortable with this method of notice. 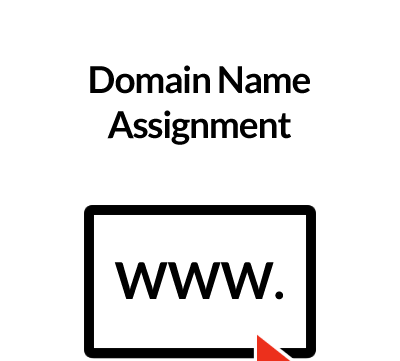 • The non-assignment provision in paragraph 8.5 contains a couple of options between which the parties should choose. The brackets and bracketed language that is redundant should be deleted. • Paragraph 8.6 should not be deleted. Most states have moved away from an “all-or-nothing” approach to enforcing illegal or unenforceable contract provisions, and the severability provision in paragraph 8.6 is an attempt to instruct a court to take a flexible approach to the Agreement in the event that one or more clauses prove to be illegal or otherwise enforceable, provided that it is still possible for the essential intent of the parties to be achieved. Paragraph 9 is commonly referred to as a “merger” clause, and is intended to avoid pre-contract discussions from surviving into the written contract. It also stipulates that amendment and waivers of the Agreement must be in writing in order to be effective. Excellent Service all round. ContractStore had exactly what I needed. Professional contract, quick purchase, great communication you get a response to queries same day. I purchased the security contract that was tailored to my business. Online purchase was quick, easy to follow on the website and within minutes I was downloading my new contract. I highly recommend Contract Store - we will definitely use their services again in the future. 10/10 service. A very happy customer.